Yes, you read the title correctly – I have a guest post to share with you! And I am sure you will salivating at just the pictures alone. For a start, can I just say how excited I am to be guest blogging on Cook With Sheenie? 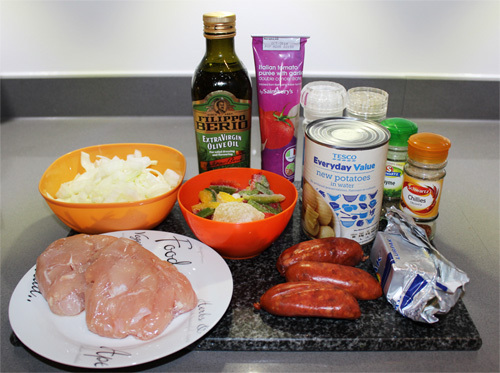 One of my favourite dinners ever was born from a recipe on this here blog – Sheenie’s incredible Butter Chicken. We’ve cooked for one another several times, and one huge difference I’ve noticed in our styles of cooking is that Sheenie is very precise with recipes and measurements (probably born from baking which is definitely an exact science), whereas I’m what my mum would call a ‘Chuck-it-in Charlie’ – that is, I generally just chuck stuff in a pan and see what happens. That’s precisely how this smoky paprika concoction of deliciousness came about. 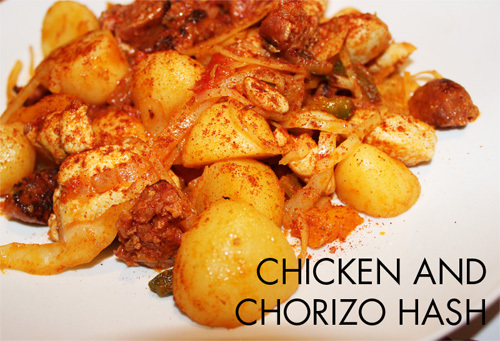 Allow me to share with you my Chicken and Chorizo Hash. 1. As you can see, I don’t really do measuring! A couple of notes: the drained weight of my tin of potatoes is 345g and I found this left me with probably a bit too much potato. These are large cans, so in future I think I’ll just go for a normal, small can. I’ll also take this moment to extoll the virtues of tinned potatoes. Don’t get me wrong, I always use ‘proper’ potatoes if I’m making chips, mash etc but for dinners like this I’ll always favour tinned. They cost next to nothing and they’re already cooked so they only require heating through which saves the faff of par-boiling and so forth. I like to cook quickly! 2. So, start off by removing your chorizo from its casing (use a sharp knife to cut a slit lengthways and just pop it out of the skin). Roughly chop it into fingertip-sized chunks and throw it into a large pan on medium heat with the tiniest drizzle of olive oil. You really do need the tiniest bit of oil, as the chorizo will start to release its own delicious paprika-ry juices in just a moment. 3. 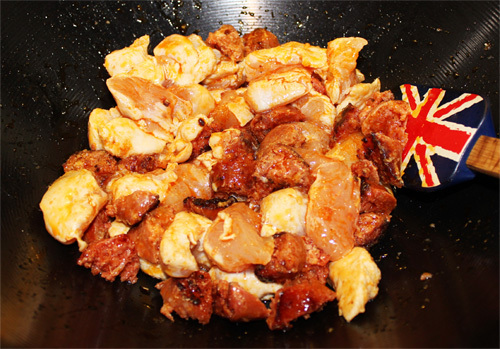 Keep the chorizo moving, and once those juices start to make an appearance add your diced chicken and stir. Continue to brown for a few minutes. If you’re using frozen garlic, pop that in there now. Add a good pinch of thyme and chillies, a knob of butter if you’re feeling naughty, and a squeeze (maybe a tablespoon or so) of tomato puree. Oh, and if you’re interested, my awesome Union Jack spatula is from Lakeland! 4. Once the chicken is all sealed (no pink showing on the outside), add the cabbage and onion. 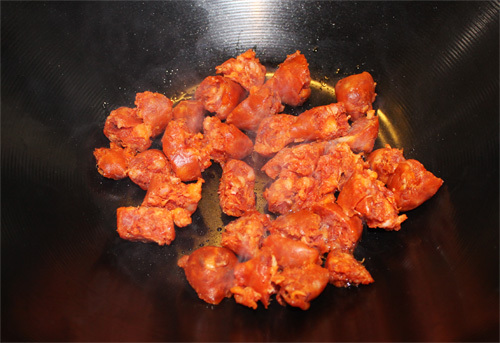 Continue to stir for a few minutes while they sweat down and take on the orangey colour of the paprika from the chorizo. 5. Now throw in the peppers, and if you’re using fresh garlic rather than frozen now’s the time to add that too. 6. While the peppers are starting to cook, drain the potatoes reserving a tablespoon or two of the starchy water. 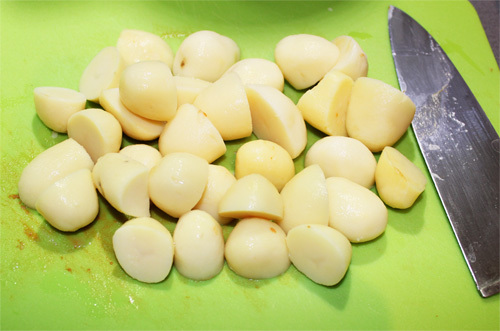 Some of the potatoes will be tiny anyway, but any larger ones should be chopped into bite-size pieces. 7. 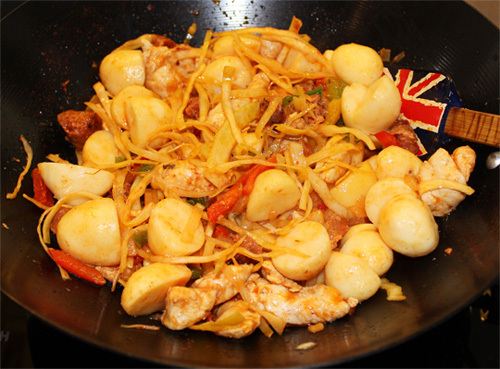 Chuck in the potatoes and the couple of tablespoons of liquid, and give it all a good twist of salt and pepper and a stir. The starchy potato water will help coat everything in a sort-of sauce at the end. 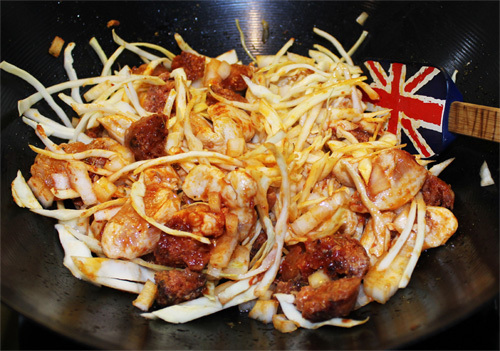 Now, pop a lid on the pan and leave well alone for 5 minutes. Give the whole thing a final stir to make sure everything’s well distributed and pale high on plates. 8. I served mine with an extra shaking of paprika on top and a crusty roll which is one hundred percent necessary (ahem) to mop up all the tasty paprika juice left on your plate… mmm. 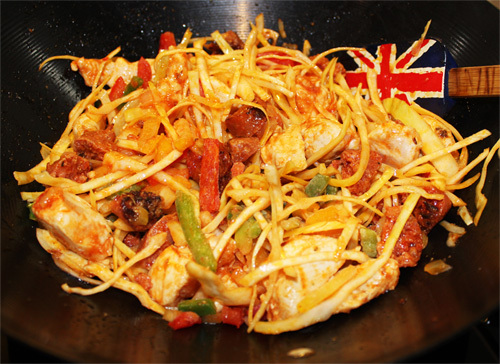 It would also be great with some grated cheddar sprinkled on top, or chopped spring onions. So there we go, that is my slapdash style of cooking and this was pretty damn delectable if I do say so myself. Note that the veggies can definitely be changed around according to what you’ve got lingering in the fridge – I’m very much of the ‘use what you’ve got’ school of thought. 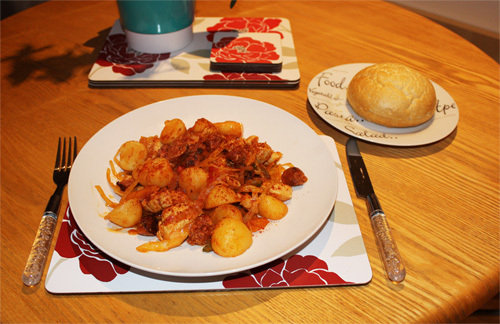 Really hope you enjoyed the post – and that you enjoy the food if you make it!